Halloween activities include trick-or-treating (or the related guising), attending Halloween costume parties, decorating, carving pumpkins into jack-o'-lanterns, lighting bonfires, apple bobbing and divination games, playing pranks, visiting haunted attractions, telling scary stories and watching horror films. In many parts of the world, the Christian religious observances of All Hallows' Eve, including attending church services and lighting candles on the graves of the dead, remain popular, although elsewhere it is a more commercial and secular celebration. Some Christians historically abstained from meat on All Hallows' Eve, a tradition reflected in the eating of certain foods on this vigil day, including apples, potato pancakes and soul cakes. The word Halloween or Hallowe'en dates to about 1745 and is of Christian origin. The word "Hallowe'en" means "hallowed evening" or "holy evening". It comes from a Scottish term for All Hallows' Eve (the evening before All Hallows' Day). In Scots, the word "eve" is even, and this is contracted to e'en or een. Over time, (All) Hallow(s) E(v)en evolved into Hallowe'en. Although the phrase "All Hallows'" is found in Old English (ealra hālgena mæssedæg, all saints mass-day), "All Hallows' Eve" is itself not seen until 1556. Today's Halloween customs are thought to have been influenced by folk customs and beliefs from the Celtic-speaking countries, some of which are believed to have pagan roots. Jack Santino, a folklorist, writes that "there was throughout Ireland an uneasy truce existing between customs and beliefs associated with Christianity and those associated with religions that were Irish before Christianity arrived". Historian Nicholas Rogers, exploring the origins of Halloween, notes that while "some folklorists have detected its origins in the Roman feast of Pomona, the goddess of fruits and seeds, or in the festival of the dead called Parentalia, it is more typically linked to the Celtic festival of Samhain, which comes from the Old Irish for "summer's end". Samhain (pronounced SAH-win or SOW-in) was the first and most important of the four quarter days in the medieval Gaelic calendar and was celebrated in Ireland, Scotland and the Isle of Man. It was held on or about 31 October – 1 November and a kindred festival was held at the same time of year by the Brittonic Celts; called Calan Gaeaf in Wales, Kalan Gwav in Cornwall and Kalan Goañv in Brittany. For the Celts, the day ended and began at sunset; thus the festival began on the evening before 1 November by modern reckoning. Samhain and Calan Gaeaf are mentioned in some of the earliest Irish and Welsh literature. The names have been used by historians to refer to Celtic Halloween customs up until the 19th century, and are still the Gaelic and Welsh names for Halloween. Samhain/Calan Gaeaf marked the end of the harvest season and beginning of winter or the 'darker half' of the year. Like Beltane/Calan Mai, it was seen as a liminal time, when the boundary between this world and the Otherworld thinned. This meant the Aos Sí (pronounced ees shee), the 'spirits' or 'fairies', could more easily come into our world and were particularly active. Most scholars see the Aos Sí as "degraded versions of ancient gods [...] whose power remained active in the people's minds even after they had been officially replaced by later religious beliefs". The Aos Sí were both respected and feared, with individuals often invoking the protection of God when approaching their dwellings. At Samhain, it was believed that the Aos Sí needed to be propitiated to ensure that the people and their livestock survived the winter. Offerings of food and drink, or portions of the crops, were left outside for the Aos Sí. The souls of the dead were also said to revisit their homes seeking hospitality. Places were set at the dinner table and by the fire to welcome them. The belief that the souls of the dead return home on one night of the year and must be appeased seems to have ancient origins and is found in many cultures throughout the world. In 19th century Ireland, "candles would be lit and prayers formally offered for the souls of the dead. After this the eating, drinking, and games would begin". Throughout Ireland and Britain, the household festivities included rituals and games intended to foretell one's future, especially regarding death and marriage. Apples and nuts were often used in these divination rituals. They included apple bobbing, scrying or mirror-gazing, pouring molten lead or egg whites into water, and dream interpretation. Special bonfires were lit and there were rituals involving them. Their flames, smoke and ashes were deemed to have protective and cleansing powers, and were also used for divination. In some places, torches lit from the bonfire were carried sunwise around homes and fields to protect them. It is suggested that the fires were a kind of imitative or sympathetic magic – they mimicked the Sun, helping the "powers of growth" and holding back the decay and darkness of winter. In Scotland, these bonfires and divination games were banned by the church elders in some parishes. Later, these bonfires served to keep "away the devil". From at least the 16th century, the festival included mumming and guising in Ireland, Scotland, the Isle of Man and Wales. This involved people going house-to-house in costume (or in disguise), usually reciting verses or songs in exchange for food. It may have originally been a tradition whereby people impersonated the Aos Sí, or the souls of the dead, and received offerings on their behalf, similar to the custom of souling (see below). Impersonating these beings, or wearing a disguise, was also believed to protect oneself from them. It is suggested that the mummers and guisers "personify the old spirits of the winter, who demanded reward in exchange for good fortune". In parts of southern Ireland, the guisers included a hobby horse. A man dressed as a Láir Bhán (white mare) led youths house-to-house reciting verses—some of which had pagan overtones—in exchange for food. If the household donated food it could expect good fortune from the 'Muck Olla'; not doing so would bring misfortune. In Scotland, youths went house-to-house with masked, painted or blackened faces, often threatening to do mischief if they were not welcomed. F. Marian McNeill suggests the ancient festival included people in costume representing the spirits, and that faces were marked (or blackened) with ashes taken from the sacred bonfire. In parts of Wales, men went about dressed as fearsome beings called gwrachod. In the late 19th and early 20th century, young people in Glamorgan and Orkney cross-dressed. Elsewhere in Europe, mumming and hobby horses were part of other yearly festivals. However, in the Celtic-speaking regions they were "particularly appropriate to a night upon which supernatural beings were said to be abroad and could be imitated or warded off by human wanderers". From at least the 18th century, "imitating malignant spirits" led to playing pranks in Ireland and the Scottish Highlands. Wearing costumes and playing pranks at Halloween spread to England in the 20th century. The "traditional illumination for guisers or pranksters abroad on the night in some places was provided by turnips or mangel wurzels, hollowed out to act as lanterns and often carved with grotesque faces". By those who made them, the lanterns were variously said to represent the spirits, or were used to ward off evil spirits. They were common in parts of Ireland and the Scottish Highlands in the 19th century, as well as in Somerset (see Punkie Night). In the 20th century they spread to other parts of England and became generally known as jack-o'-lanterns. Today's Halloween customs are also thought to have been influenced by Christian dogma and practices derived from it. Halloween is the evening before the Christian holy days of All Hallows' Day (also known as All Saints' or Hallowmas) on 1 November and All Souls' Day on 2 November, thus giving the holiday on 31 October the full name of All Hallows' Eve (meaning the evening before All Hallows' Day). Since the time of the early Church, major feasts in Christianity (such as Christmas and Easter) had vigils which began the night before, as did the feast of All Hallows'. These three days are collectively called Allhallowtide and are a time for honoring the saints and praying for the recently departed souls who have yet to reach Heaven. Commemorations of all saints and martyrs were held by several churches on various dates, mostly in springtime. In 609 or 610, Pope Boniface IV dedicated the Pantheon in Rome to St. Mary and All Martyrs on 13 May. This was the same date as Lemuria, an ancient Roman festival of the dead, as well as the same date as the common commemoration of Saints took place in Edessa at the time of Ephrem. The feast of All Hallows', on its current date in the Western Church, may be traced to Pope Gregory III's (731–741) founding of an oratory in St Peter's for the relics all the saints. In 835, All Hallows' Day was officially switched to 1 November, the same date as Samhain, at the behest of Pope Gregory IV. Some suggest this was due to Celtic influence, while others suggest it was a Germanic idea, although it is claimed that both Germanic and Celtic-speaking peoples commemorated the dead at the beginning of winter. They may have seen it as the most fitting time to do so, as it is a time of 'dying' in nature. It is also suggested that the change was made on the "practical grounds that Rome in summer could not accommodate the great number of pilgrims who flocked to it", and perhaps because of public health considerations regarding Roman Fever – a disease that claimed a number of lives during the sultry summers of the region. By the end of the 12th century they had become holy days of obligation across Europe and involved such traditions as ringing church bells for the souls in purgatory. In addition, "it was customary for criers dressed in black to parade the streets, ringing a bell of mournful sound and calling on all good Christians to remember the poor souls." "Souling", the custom of baking and sharing soul cakes for all christened souls, has been suggested as the origin of trick-or-treating. The custom dates back at least as far as the 15th century and was found in parts of England, Flanders, Germany and Austria. Groups of poor people, often children, would go door-to-door during Allhallowtide, collecting soul cakes, in exchange for praying for the dead, especially the souls of the givers' friends and relatives. Soul cakes would also be offered for the souls themselves to eat, or the 'soulers' would act as their representatives. Shakespeare mentions souling in his comedy The Two Gentlemen of Verona (1593). On the custom of wearing costumes, Christian minister Prince Sorie Conteh wrote: "It was traditionally believed that the souls of the departed wandered the earth until All Saints' Day, and All Hallows' Eve provided one last chance for the dead to gain vengeance on their enemies before moving to the next world. In order to avoid being recognized by any soul that might be seeking such vengeance, people would don masks or costumes to disguise their identities". It is claimed that, in the Middle Ages, churches that were too poor to display the relics of martyred saints at Allhallowtide let parishioners dress up as saints instead. Some Christians observe this custom at Halloween today. Lesley Bannatyne believes this could have been a Christianization of an earlier pagan custom. It has been suggested that the carved jack-o'-lantern, a popular symbol of Halloween, originally represented the souls of the dead. On Halloween, in medieval Europe, "fires [were] lit to guide these souls on their way and deflect them from haunting honest Christian folk." Households in Austria, England and Ireland often had "candles burning in every room to guide the souls back to visit their earthly homes". These were known as "soul lights". Many Christians in mainland Europe, especially in France, believed "that once a year, on Hallowe'en, the dead of the churchyards rose for one wild, hideous carnival" known as the danse macabre, which has often been depicted in church decoration. Christopher Allmand and Rosamond McKitterick write in The New Cambridge Medieval History that "Christians were moved by the sight of the Infant Jesus playing on his mother's knee; their hearts were touched by the Pietà; and patron saints reassured them by their presence. But, all the while, the danse macabre urged them not to forget the end of all earthly things." An article published by Christianity Today claimed that the danse macabre was enacted at village pageants and at court masques, with people "dressing up as corpses from various strata of society", and suggested this was the origin of modern-day Halloween costume parties. The modern imagery of Halloween comes from many sources, including Christian eschatology, national customs, works of Gothic and horror literature (such as the novels Frankenstein and Dracula) and classic horror films (such as Frankenstein and The Mummy). Imagery of the skull, a reference to Golgotha, in the Christian tradition, serves as "a reminder of death and the transitory quality of human life" and is consequently found in memento mori and vanitas compositions; skulls have therefore been commonplace in Halloween, which touches on this theme. Traditionally, the back walls of churches are "decorated with a depiction of the Last Judgment, complete with graves opening and the dead rising, with a heaven filled with angels and a hell filled with devils," a motif that has permeated the observance of this triduum. One of the earliest works on the subject of Halloween is from Scottish poet John Mayne, who, in 1780, made note of pranks at Halloween; "What fearfu' pranks ensue! ", as well as the supernatural associated with the night, "Bogies" (ghosts), influencing Robert Burns' "Halloween" (1785). Elements of the autumn season, such as pumpkins, corn husks and scarecrows, are also prevalent. Homes are often decorated with these types of symbols around Halloween. Halloween imagery includes themes of death, evil, and mythical monsters. Black, orange, and sometimes purple are Halloween's traditional colors. Trick-or-treating is a customary celebration for children on Halloween. 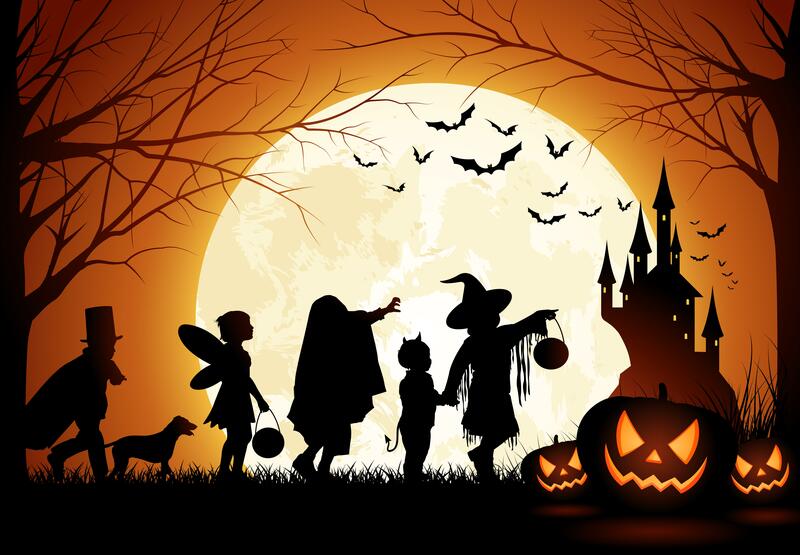 Children go in costume from house to house, asking for treats such as candy or sometimes money, with the question, "Trick or treat?" The word "trick" refers to "threat" to perform mischief on the homeowners or their property if no treat is given. The practice is said to have roots in the medieval practice of mumming, which is closely related to souling. John Pymm writes that "many of the feast days associated with the presentation of mumming plays were celebrated by the Christian Church." These feast days included All Hallows' Eve, Christmas, Twelfth Night and Shrove Tuesday. Mumming, practiced in Germany, Scandinavia and other parts of Europe, involved masked persons in fancy dress who "paraded the streets and entered houses to dance or play dice in silence." A popular variant of trick-or-treating, known as trunk-or-treating (or Halloween tailgaiting), occurs when "children are offered treats from the trunks of cars parked in a church parking lot," or sometimes, a school parking lot. In a trunk-or-treat event, the trunk (boot) of each automobile is decorated with a certain theme, such as those of children's literature, movies, scripture, and job roles. Trunk-or-treating has grown in popularity due to its perception as being more safe than going door to door, a point that resonates well with parents, as well as the fact that it "solves the rural conundrum in which homes [are] built a half-mile apart". Eddie J. Smith, in his book Halloween, Hallowed is Thy Name, offers a religious perspective to the wearing of costumes on All Hallows' Eve, suggesting that by dressing up as creatures "who at one time caused us to fear and tremble", people are able to poke fun at Satan "whose kingdom has been plundered by our Saviour." Images of skeletons and the dead are traditional decorations used as memento mori. There are several games traditionally associated with Halloween parties. One common game is dunking or apple bobbing, which may be called "dooking" in Scotland in which apples float in a tub or a large basin of water and the participants must use their teeth to remove an apple from the basin. The practice is thought by some to have derived from the Roman practices in celebration of Pomona. A variant of dunking involves kneeling on a chair, holding a fork between the teeth and trying to drive the fork into an apple. Another common game involves hanging up treacle or syrup-coated scones by strings; these must be eaten without using hands while they remain attached to the string, an activity that inevitably leads to a very sticky face. Some games traditionally played at Halloween are forms of divination. In All Hallows' Eve celebrations during the Middle Ages, these activities historically occurred only in rural areas of medieval Europe and were only done by a "rare few" as these were considered to be "deadly serious" practices. A traditional Scottish form of divining one's future spouse is to carve an apple in one long strip, then toss the peel over one's shoulder. The peel is believed to land in the shape of the first letter of the future spouse's name. Unmarried women were told that if they sat in a darkened room and gazed into a mirror on Halloween night, the face of their future husband would appear in the mirror. However, if they were destined to die before marriage, a skull would appear. The custom was widespread enough to be commemorated on greeting cards from the late 19th century and early 20th century. Another game/superstition that was enjoyed in the early 1900s involved walnut shells. People would write fortunes in milk on white paper. After drying, the paper was folded and placed in walnut shells. When the shell was warmed, milk would turn brown therefore the writing would appear on what looked like blank paper. Folks would also play fortune teller. In order to play this game, symbols were cut out of paper and placed on a platter. Someone would enter a dark room and was ordered to put her hand on a piece of ice then lay it on a platter. Her "fortune" would stick to the hand. Paper symbols included: dollar sign-wealth, button-bachelorhood, thimble-spinsterhood, clothespin- poverty, rice-wedding, umbrella- journey, caldron-trouble, 4-leaf clover- good luck, penny-fortune, ring-early marriage, and key-fame. The telling of ghost stories and viewing of horror films are common fixtures of Halloween parties. Episodes of television series and Hallowe'en-themed specials (with the specials usually aimed at children) are commonly aired on or before Halloween, while new horror films are often released theatrically before Halloween to take advantage of the atmosphere.